Did you know your husband cooks? If I had known my husband can cook this Kothu parotta so very well, I would have definitely prepared this and sent to MBP street food hosted by Sia. I never knew my husband could cook! Poor me! He had been hiding this great secret of his from me for a long time now (we know each other for more than 5yrs). Innocent me! With this note I have to tell you how I caught him as a chef. I must say a decent chef, for a person who doesn't even move his plate after eating. I know! My mil has pampered him in this regard. It was a week back and I had some usual problems with my health. I was feeling very tired and slept at around 5PM in the evening. I had a great dream. I was strolling with my best friend near my house(in India) and to mention, I was in my 10th std in my dream. Good old days! Miss them!.Back to my dream. We had a tiff and she was consoling me. Suddenly, I must say, these things happen only in dreams, we saw a street shop and he was preparing...of course Kothu parotta. Though we generally do not like the ambiance, the aroma lured us into the shop and obviously we were drooling. The waiter, instead of asking what we wanted to eat was yelling 'Get up! Its 8.00PM. Time to Eat! You can sleep after that.' and that too in my husbands voice. lol! By now, all know that my sleep got disturbed and I was sitting with a plate full of Kothu Parotta prepared by my loving husband. Though I was very happy, I couldn't tolerate the fact that he messed up my kitchen. Yes! the Kothu Parotta tasted Divine. But my kitchen!omg! was a mess. I spent 30 mts cleaning it. But, it was a sweet surprise. I have requested him to give surprises like this, even if it takes my time to clean up after he is done with his surprises. 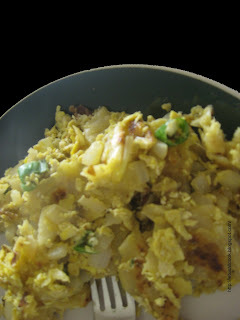 Now coming to the recipe (My husband's version of Egg Kothu Parotta). Cook the Parotta. If Frozen parotta is used, then heat it and cook it before preparing this recipe. Cut the parotta into small pieces. They need not be even, but need to be small. In a pan, add oil and saute the onions till they turn light brown. Now add the green chillies and half the salt. When the egg is half cooked ,add the cut parotta and mix well. Now check for salt and if needed add some. While mixing, use a spatula to do a repeated pounding so that the egg,parotta and the onions mix well. Serve hot with any of your favourite side dish. I loved it without any. You can also do chicken kothu parotta, meat kothu parotta, the same way and adding more spices to the recipe. I hope every married women would have had an experience like this. Sharing can be fun. Did you know your husband cooks? Waiting to hear your stories. mmm.. ur hubby has the done the dish so perfect... convey my regards to him! LOL at your dream! Loved reading the post. Your hubby sure made a delicious food for you. Why don't you ask him to surprise you even more by cleaning the kitchen after cooking? He he! that kothu parota looks delicious..should tell my hubby about it!! Another surprise for you waiting in my blog!! Yes, my Hubby can cook. Not only that, he is a back-seat cook, too! (That means he gives me tips and lectures from the couch when I am cooking!) I have featured several of his dishes on my blog. BTW, what is a parotta? lucky us ning! parotta is similar to roti (flat bread) made of all purpose flour! I am glad mine doesn't cook for obvious reasons!!! My hubby cooks really well! and I finally managed to train him on cleaning up after cooking! thank god!